I’ve had the house to myself today. A quiet house is such a nice place to just be. I listened to Norah Jones, Zooey Dechanel, M. Ward, Willie Nelson, Bing, Frank, Nat and Ella serenade me with Christmas carols as I began decorating the house for Christmas. I’m taking it slow this year. One room at a time, cleaning and polishing and putting Autumn things away as I excavate the attic for our Christmas things. Today I decorated the fireplace mantle. I went through my over-full linen hutch in search of white lace doilies and found quite a pile of them in a drawer. I just love the overall effect of how it turned out. I’ll post some photos of that soon. Here’s a yummy recipe for you. I just love mashed potatoes, don’t you? the quintessential Holiday comfort food. The browned butter makes this particular recipe sing. Caramely and rich and oh- soooooo good! Bring large pot of potatoes, covered with water, to boil. Cook until tender (about 45 minutes.) Drain well. Place in a large mixing bowl. Mix with the sour cream, cheese, garlic, horseradish, parsley and onion. Mash with a potato masher or electric mixer. Add a little buttermilk or whole milk if the potatoes seem too thick, and to make the mashing a bit easier, if you wish. Transfer potatoes to individual serving bowls and drizzle some of the browned butter over each serving. Salt and pepper to taste. These look absolutely scrumptious!!!! Definitely on my menu for Christmas! They will be perfect for my prime rib! Thank you!!! Wow! This is like a revolutionary way to serve mashed potatoes! I cannot wait to try it!! I think you’re right Gigi 🙂 enjoy, and thanks for stopping by! Those look amazing, I just loved reading what you wrote too! Can’t wait to see the pictures. I made this many years ago & now I want to go back to it. It’s a “hit” always!! Thanks! Love your bowl I’ve collected courier and Ives for 40 years and love to see them pop up in a new spot! OMG these look so good. I must try them! Hi Terrie! Enjoy! these are a favorite in our house! 🙂 xo and thanks for visiting! This sounds really yummy, but what really drew my attention was the Currier and Ives bowl! My grandmother had that same collection and I was lucky to get them & I love them! Hi Dale! So happy you like the recipe (and the dishes!) I collect blue and white china in all patterns, and only have a few pieces of the Currier & Ives 😉 Thanks for stopping by! I usually only eat mashed potatoes in the fall and winter but I don’t even care that the hot weather is coming, I need these in my life. ASAP. Had these for dinner tonight with salad. So good!!! We have the same dishes!! I grew up eating Cauliflower with browned butter. I recently found out that browned butter on freshly popped corn is awesome, that was an accident as I was melting the butter in a pot that was to hot. I can’t wait to try mashed potatoes with it!! ooooooh! I’ve never tried it on popcorn! awesome idea, Judy! thanks for stopping by 🙂 enjoy those potatoes. You’re in for a treat! These potatoes look incredible! Great recipe and great picture! I was thinking of a new twist on twice baked potatoes to go with prime rib…. 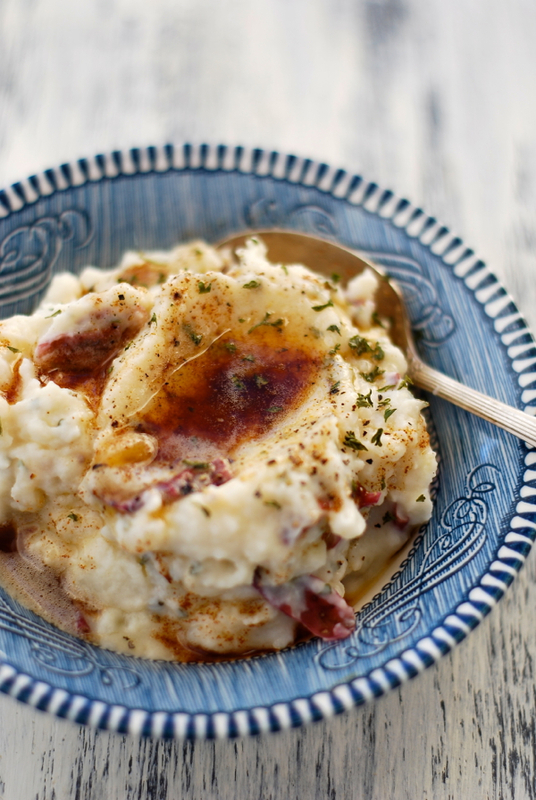 The thought of using your mashed potatoes as a filling has definitely intrigued me, but do you think it would be too rich of a pairing? Omg we have the same plates..
Could u pls tell me where did u get them from? What do you mean by brown butter? Instead of putting these in indivual bowls could you prepare them in one casserole dish as I woul like to take it to a pot luck? They sound sooooo yummy, compared to plain mashed potatoes . Thanks in advance. Do you have to have the horseradish? Do you use/recommend salted or unsalted butter for the browned butter? Hi Linda 🙂 I use unsalted.